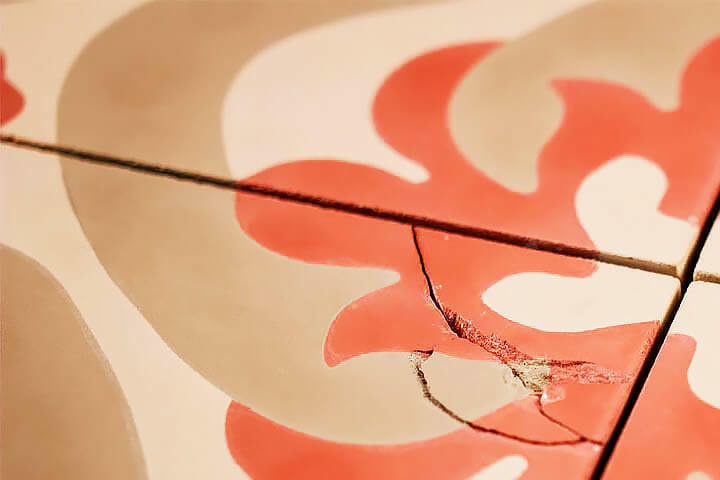 When underlying floor problems occur, cracks in ceramic tiles can result. Many have watched a homeowner and home inspector express concern about cracks in ceramic tile flooring. Any type of random, jagged crack inside a home creates alarm in a buyer and there is nothing more disturbing than cracked ceramic tile. It also detracts from the appearance of an otherwise beautiful flooring material. Included are the most common causes of ceramic tile cracks and possible solutions to correct them. The other cause of cracks in ceramic tiles over concrete slabs is related to settlement cracking in the concrete slab foundation. These cracks are usually larger than shrinkage cracks and can often be distinguished from shrinkage cracks by looking for settlement cracks in the surrounding walls. When concrete slab foundations settle, cracks usually form in the walls above window and door openings. Settlement cracks can also be verified by performing a floor level survey. Significant settlement may require foundation repair. Whenever cracks in ceramic tile form over wood floors, the cause is generally two fold: either the floor system is expanding and contracting excessively from seasonal moisture changes or there is a floor structure problem (e.g., excessive floor deflection). The Tile Council of America (TCA) and American National Standards Institute (ANSI) have long argued that ceramic tile should not be placed over OSB sub flooring, which is probably the most common type of floor sheathing material used today. Until 2005, the TCA recommended that tile only be placed over plywood sub flooring. In 2005, they developed detail F155-05 which allows the use of OSB sub flooring in residential applications. However, they still require that a second layer of plywood (underlayment) be placed over the OSB. Our firm has inspected a large number of cracked ceramic tile floors that had cement backer board placed over OSB sub flooring, and in nearly all cases, we concluded that the cracks were related to movement in the OSB sub flooring. This movement is caused by seasonal humidity changes, especially when the floor overlies a ventilated crawl space or unconditioned basement. The cracks in the tile will typically form in orthogonal patterns that usually reflect the panel joints in the underlying OSB or cement backer board. Whenever these types of cracks develop, the homeowner is faced with either accepting the cracks, trying to control seasonal moisture changes in the sub-flooring, or removing the tile, replacing the OSB sub flooring with plywood, and reinstalling the tile. If the later is done, then the tile should be installed in strict accordance with one of the Standard Installation Procedures described in the TCA Handbook for Ceramic Tile Installation. This document can be purchased from TCA by phone at 864-646-8453. If you plan to have ceramic tile flooring installed in your home, insist that it be installed per one of TCA’s approved Installation Methods.